Shirley Zindler is an animal control officer in Northern California and the author of The Secret Life of Dog Catchers: An Animal Control Officer’s Passion to Make a Difference. She also writes a blog series for The Bark magazine. Shirley and her family regularly foster and care for dogs in need. Hilda wasn’t much to look at. 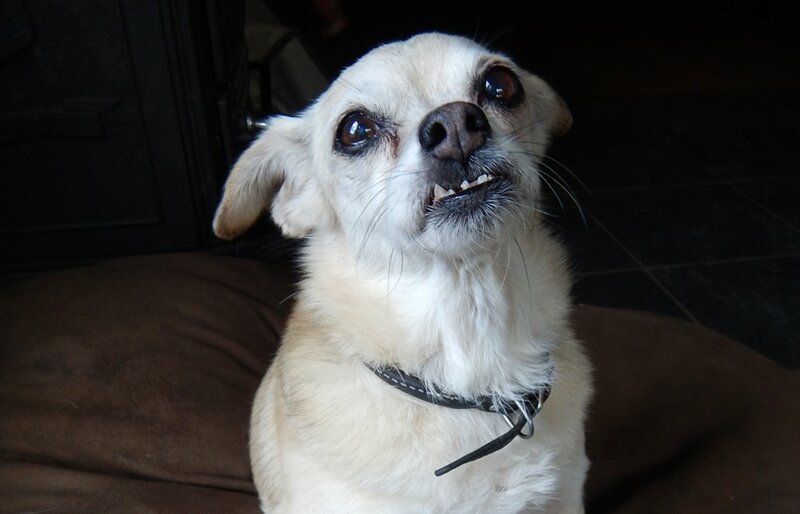 Maybe fifteen pounds of Pekingese mix, she was elderly with short little bow legs, quite an underbite, and jutting snaggle teeth. Her muzzle was graying, eyes cloudy, coat dull and the fur on her rump was sparse, likely from chronic flea allergies. She had been left behind in the backyard of a foreclosed home and was probably around 12 or 13 years old. The shelter had treated her fleas and worms and spayed and vaccinated her, but people weren’t exactly beating the door down to adopt her. She would gaze through the chain link, wag her tail hopefully at passersby for a while. then go curl up in her bed to sleep the day away. I’ve got a thing for the old dogs. Especially homeless old dogs. As an animal control officer with more than 25 years working in shelters, I’ve seen my share. Something about those grey faces peering through the chain link always stops me in my tracks. Old dogs have such a dignity and grace about them. Even the ones who are neglected, matted and mangy have a serenity that melts me. They make me want to give them the life they deserve, to make their last months or years as special and precious as possible. I’ve seen so many old dogs on the job that were lost and never claimed, or left neglected in their senior years. I’ve had my heart broken a thousand times and dripped bitter, miserable tears over the ones I couldn’t save. But when I see an old dog finally get a loving home the highs are so high, and the joy is so great as to make it worth the pain. It had been on my life’s list, my bucket list, to adopt an old dog; however, the timing wasn’t right when Hilda was there. Later, 11-year-old Patty would come into our home as a foster. An emaciated, elderly and neglected Pit Bull, Patty had the sweetest disposition ever. I had picked her up as a stray and was so horrified by her condition that I promised her I would seek justice. I consulted with a friend who is a DA investigator and together we were able to track down the former owners who neglected and abandoned her. They were arrested, and when the court case resolved, with a felony conviction for animal cruelty, Patty became our forever dog. To see her now, shiny and happy and adored by everyone, has been one of the most rewarding things we have ever done. If it had been possible then, I would have taken Hilda in a heartbeat. I have friends who only adopt elderly dogs. They take them in, love them and shower them with every comfort. They give them the life they deserve and when they have to say good-bye, they grieve mightily and go right out and do it again. They rave about how old dogs are so delightful and easy, but they were at their limit then too and Hilda continued to wait. I was still fretting about Hilda when I met with some dog loving friends who often get together on Monday nights for what we jokingly call ladies night. It’s a wonderful group and includes a woman named Jann who many people find intimidating, myself included. But Jann is also engaging and down to earth and totally devoted to her dogs. The first time I met her she looked at me sternly when she learned that I was an animal control officer and worked at a shelter. “How can you do that?” she demanded. I looked back in surprise and said, “How can I not?” I told her I felt like I could make a difference and that the animals needed compassionate people to care for them. She seemed to respect that and we became friends. Jann told me that she would like to adopt an old dog in need but she refused to enter a shelter or even look online. She asked me to just pick out a little dog for her. It didn’t really matter what breed or type, just an older dog needing a soft place to land for the rest of their life. I told her I knew of just the one. It was so fun to walk through the shelter the next day, past all the beautiful, adoptable, young dogs to Hilda’s kennel. It was the best feeling to slip a lead on her and know that she was finally going to have the life she deserved. I bathed her and gathered up her paperwork and we walked out the shelter door together. She trotted slowly alongside me with her funny little rolling gait as we headed for my car. Hilda got the love and life every dog should have. Photo Courtesy of Shirley Zindler. She was good as gold on the drive to Jann’s. She curled up on the seat next to me and looked around her curiously. At a stop light, I glanced over at her and she caught my gaze. I felt my heart in my throat as she looked at me. Something so special passed between us and when the light changed I had to tear my eyes back to the road. I reached over and stroked her sweet face and then her belly as I drove, feeling privileged to be part of her journey. As the ride progressed, she rolled over flat on her back and relaxed completely. By the time we reached Jann’s she was sound asleep. Jann welcomed Hilda and the introduction to her dogs went well. Jann’s beautiful country home is full of cushy beds and other amenities for the comfort of the dogs, and the door is always open, so the dogs can access her big fenced yard. Her other dogs, large and small, were in excellent condition and bounded happily around the house as Hilda checked out her new digs. After a thorough inspection, Hilda curled up on the nearest cushy bed and sighed a contented sigh. Over the next several months, I got occasional updates from Jann. Hilda was doing well and the transition had gone smoothly. About six months later, I saw Hilda again and the change was amazing. It seemed that 5 years had been taken off her age. Her coat had filled out and was silky soft. Her eyes were brighter and she had better muscle tone. I was so impressed and told Jann so. Jann didn’t seem to think much of it. She saw Hilda every day so the physical changes wouldn’t have been so evident but she did rave about how Hilda’s personality continued to blossom the longer she had her. It’s been several years now since Hilda was adopted and she recently developed a mild cough. Jann had her right into the vet where she was diagnosed with an inoperable lung tumor. Hilda probably doesn’t have a lot of time left but she’s happy and comfortable. I went to see her, for what will probably be our last good-bye. She still looks good but has slowed down and I know it won’t be long. My eyes filled with tears and there was a lump in my throat, but in my world of unwanted shelter dogs, Hilda has what every dog should have. The past is ancient history. Hilda is loved, wanted, and finally got the life she deserved. You can read more from Shirley Zindler in her book, The Secret Life of Dog Catchers and in her blog series for The Bark magazine. You can also follow her on her Facebook page. About the Contributor: Shirley Zindler is an animal control officer in Northern California and the author of The Secret Life of Dog Catchers: An Animal Control Officer’s Passion to Make a Difference. Shirley has been published in Cat Fancy, the San Francisco Chronicle, Bark Magazine and numerous other dog and shelter related publications. She is the mother of two grown children and lives with her husband Paul, multiple dogs, several cats and an endless rotation of foster dogs in need.